There is a lot to be said for learning on the job – and by not just having experiences but also paying attention to them, we can embed this learning quickly and improve our self awareness and insight at the same time. Putting time aside for simple, ‘just-in-time’ reflective practice, like our ‘simple daily 5 minute mindfulness activity’ can help facilitate practical learning, can help us to form new good habits and break less helpful ones, and positively impact our wellbeing. There are also times when an even greater block of time needs to be set aside to take stock of a big piece of work – be it individual or collective. We need to create space that has the purpose of not only measuring success but also for the even more important purpose of longer term learning. Last year we came across a post by Michael Bungay Stanier with 5 simple but very powerful questions that individuals and teams could use as a basic framework. I’ve made a visual that you can print out and use to guide conversation. What I like about these questions is the very open exploration they will encourage. What were we trying to do? Always connecting back to the ‘WHY’ – the purpose. What happened? An open sense of curiosity helps people to capture some data and a range of perspectives before moving to deeper level understanding of results and meaning (ie the ‘so what’?). What can we learn from this? This questions encourages people to make sense of the data / the detail that has been shared. When that happens, what is it like? How does it feel? What is the impact / result? And what does that mean for us? for the customer? for our process? What can we keep doing? What next? What do we commit to? Who will do what and when? 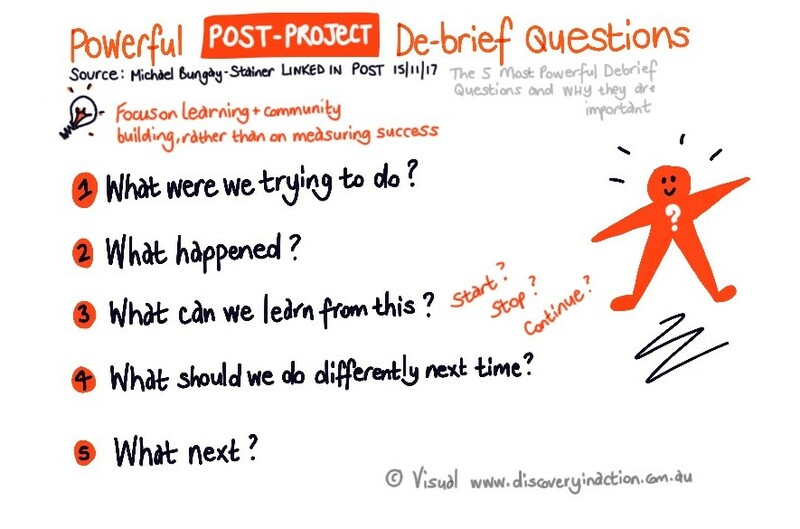 Next time you see an opportunity for a learning-driven retrospective or project debrief, why not give these 5 questions a go! ← Practical Leadership Actions #6: How do I create meaning and purpose?